Tivoli Ecoresort Praia Do Forte, Bahia is a family-friendly paradise and recipient of TripAdvisor’s “Best for Families Award.” Now that one can apply for a visa to Brazil on the internet, and LATAM Airlines has non-stop flights from Miami to Salvador de Bahia, family travel to Brazil is easier to manage. It’s an overnight flight, with only an hour’s time difference, and arriving in Salvador de Bahia early morning, I found customs a breeze. The hour and a half drive north along the Coconut Coast of Bahia to Praia Do Forte is quite pleasant as the highway is well maintained. After passing through the gates that lead to the Tivoli Eco-Resort and Spa, one is immediately transported to an unexpected paradise, and greeted with happy faces, hollowed out coconuts filled with refreshing drinks and cool towels. Director Maria Helena has been pleasing guests for 30 years, and today is no exception as she welcomes me with a warm hug. 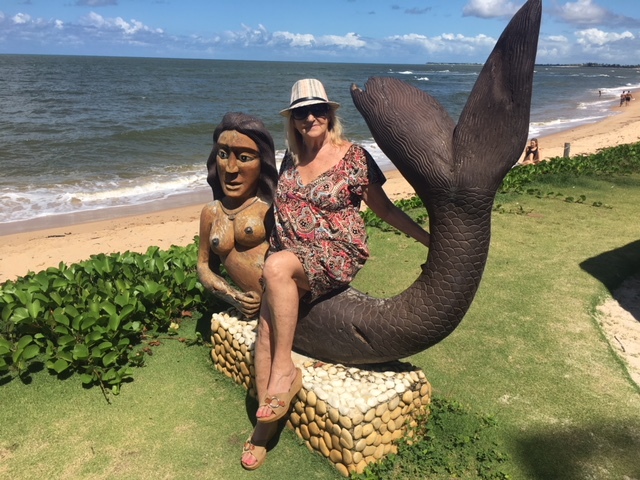 Author lounges by beach’s famous mermaid statue near Tivoli Resort, Praia do Forte, Brazil. Surrounded by the sea and the Atlantic Rainforest, with stunning landscapes, lush gardens, pristine beaches, four pools, three restaurants, and a Zen spa, this 287-rooms luxury gem, a member of Preferred Hotels, is a sanctuary for the senses … a place of rest and contemplation. It also offers more than 30 activities for adults and children. Tivoli’s chefs accommodate all tastes and present elablorate fruit, vegetable, salad, protein and fish buffets. The balcony of my elegantly appointed room, with views of the sea and an inviting hammock, was the perfect place for an afternoon siesta. Suites for families offer all the conveniences of home, and the option of having a special meal prepared in the privacy of your accommodations. Breakfast and dinner are included in one’s stay. At lunch, as a special treat, Richard Pfander, the resort’s new Food & Beverage Director, who has an impressive International culinary background with focus on healthy eating and excellent wines, grills a whole fish that has been coated in a mash of bananas and condiments. The sumptuous dinner buffet in the Goa Restaurant is fit for royalty — which is how the resort treats guests of all ages. The indoor/outdoor restaurant is spacious with plenty of room for restless kids to explore. The creatively designed and decorated gourmet spread includes an extensive selection of salads, homemade breads, meats, fish, vegetable dishes and made to order pastas; deserts are to swoon for. A musician strums his guitar; the soft sounds of salsa fill the room. Children’s splash pool at Tivoli is just one of the many fun things to do together. The hotel’s large infinity pools are ideal for swimming laps, and the white sandy beach great for an afternoon stroll, a treasure hunt, or a photo with the beach mermaid. Iguanas, rare birds and monkeys can be spotted daily as they roam freely around the grounds. And then there is the Conhega o Thalasso Spa, the resort’s sanctuary for health, beauty and well-being where one can retreat for moments of complete relaxation; it offers an extensive menu of traditional organic body rituals, massages and facials. The Careta Carela Kid’s Club, taking its name from the regional word for sea turtle, offers supervised and monitored activities for ages 4-11 from 9am to 10pm, allowing small folks to take part in sports, educational and play activities to exercise their bodies and their imaginations … from art workshops, theatrical plays, cooking classes and educational talks to tours to the Turtle sanctuary. There’s also a whimsical slide and jungle gym in a shallow pool that makes for safe fun, and a lot of splashing. Mothers can choose and plan their child’s daily lunch and dinner menu based on any religious restrictions, food allergies or health issues. Baby Care, for the convenience and welfare of the parents of infants and toddlers, is available for guests newborn to age 3. Tivoli provides customized infant food service and baby pantry facilities in various areas of the resort, enabling mothers to prepare baby meals. Baby Coolies offer fruit, cereal, milk and soup … all free of charge. Near to the hotel, Projeto Tamar, the Brazilian Sea Turtle Project, one of the most successful marine conservation programs in the world, works on the protection, research and management of five endangered sea turtle species that nest in the area. A visit to their open- air hatcheries and educational facilities is sure to delight both the young and young at heart. 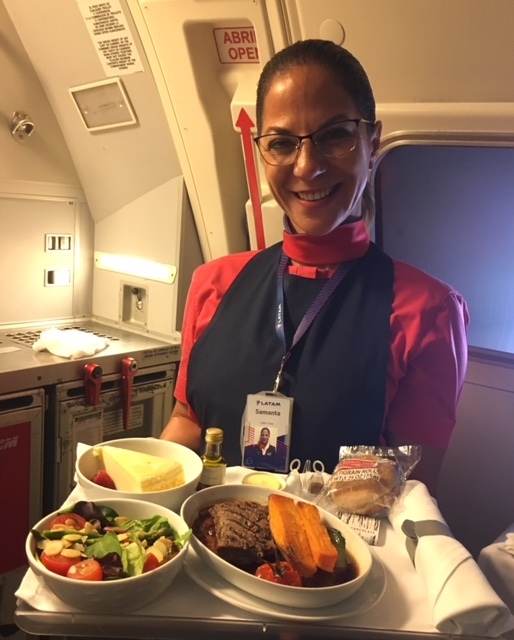 LATAM flight attendant makes families feel welcomed aboard. LATAM has 200 employees at the Miami airport, making check-in efficient and most accommodating to families traveling with kids. Economy Class is quite comfortable with a choice of three meals; all drinks are complimentary as are headsets, entertainment, blankets and pillows. Premium Business Class is first class all the way, including down comforters and flat beds. Salvador de Bahia has the heart beat and soul of Africa; it is an intoxicating fusion of African, Portuguese and Indian cultures, traditions, religions, foods and music. And with LATAM’s direct service from Miami, connecting from flights around the U.S, Bahia is one destination you don’t want to miss.